Panama Block Apartment at 229 Machray Avenue. April 16, Tuesday from 6:00 p.m. – 8:00 p.m. 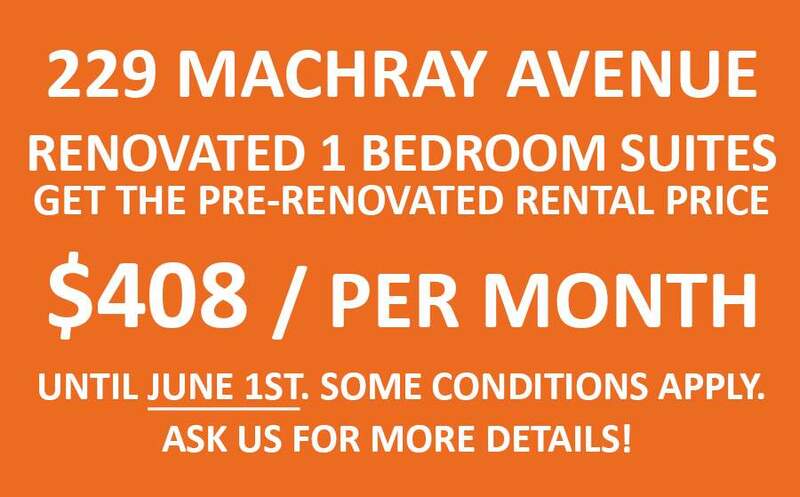 Receive 1/2 month off your first-month rent. *Promotion Expires June 1, 2019. The North Panama Block on 229 Machray Avenue is in the St. John's area and was built by Maz Zev Blankstein, a very prestigious Jewish Architect in 1914. The beautifully renovated suites feature a new kitchen and bathroom with modern finishes, classic clawfoot bathtub, energy efficient windows and blinds, vinyl wood plank flooring, stove, hood range fan, fridge, and modern ceiling fan. A great place to call home. Nearby is Champlain School and Community Child Care Centre and a 10-minute drive to Kildonan Park. This apartment building is a cat and a small dog-friendly building.